Allison Briggs has been a writer for several years, contributing features and scholarly research papers. She holds a Bachelor of Arts in communication with a minor in sociology and a Master of Arts in communication with an emphasis in health from San Diego State University. Wheat grass is certainly a wheat-based product; however, it has not yet developed the sprout that contains gluten. In most circumstances, you can have wheat grass if you are gluten sensitive. However, it is important to understand the distinction between gluten and wheat grass, as well as to know the potential for cross-contamination. You should also consider the benefits and risks of wheat grass supplementation before deciding if it is right for your diet. Gluten is a protein found in the grains of wheat, barley and rye. This protein forms in the grain of these grasses once they sprout. One in 133 Americans has sensitivity to the specific protein of gluten, states Celiac.com. Gluten sensitivity can cause a host of symptoms including gastrointestinal problems, weight issues and dysfunctions of a weakened immune system. If you have gluten sensitivity, it is important to understand which foods contain gluten. These are typically most foods made from flour, such as pizza, pasta and bread. Caution should also be used with food ingredients like starch, seasonings, additives or fillers. 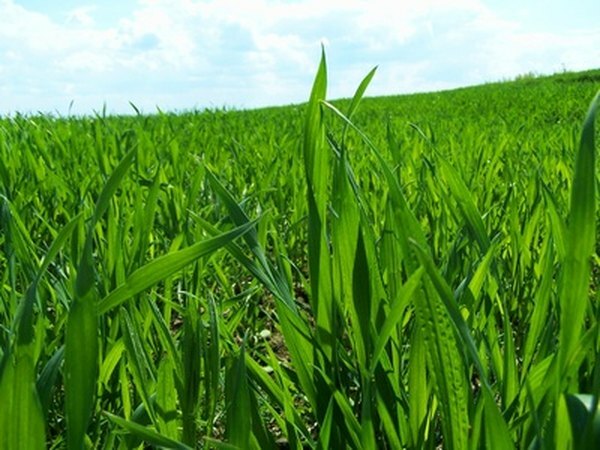 Wheat grass is the grass form of wheat before it is sprouted into a grain. Therefore, wheat grass does not contain gluten. However, due to processing, many pre-packaged foods that contain “wheat grass” may be contaminated by gluten when they are manufactured. Use caution with pre-packaged foods such as breakfast bars and smoothies. If you have questions or concerns about cross-contamination, you can contact the manufacturer directly. Wheat grass is also commonly served as a liquid drink made by purifying the grass into a juice. This form of wheat grass is gluten free, but if you have a strong sensitivity it would be wise to ensure that the juicing machine has been cleaned well and that the grass is free of any grains. Wheat grass can be consumed in many different forms. These include food products, smoothies, pressed liquid drinks, vitamins, tinctures and teas. Some people even use wheat grass to administer enemas or colonics. If you have a gluten sensitivity and are considering using wheat grass as a dietary supplement, be sure that you research the source of its manufacturing to ensure that it is entirely gluten free. In addition, it is very important to consult your physician before buying or using any form of a wheat grass product. Wheat grass is found to be high in nutrients such as vitamins, minerals, enzymes, amino acids and chlorophyll. It contains high quantities of calcium, iron, magnesium, phosphorous, zinc and potassium. Wheat grass is often considered to be energizing and cleansing to the body. Many health claims have been made about the benefits of wheat grass; however, most of these claims have not been substantiated by a reliable source. Wheat grass may seem like a good option if you are gluten sensitive; however, it is important to speak with your doctor to confirm that it is acceptable for your individual health conditions. Wheat grass has been found to have adverse side effects for some people including nausea, vomiting, headaches and hives. If you are looking to supplement your diet with additional nutrients you can also consider increasing your intake of green, leafy vegetables as these will also offer you many vitamins, minerals and enzymes.